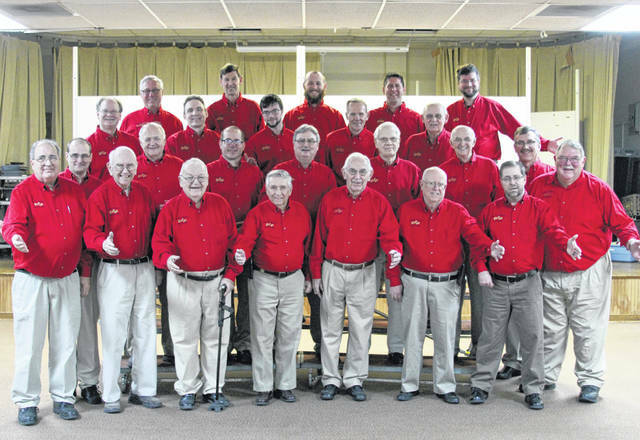 The Miami-Shelby Melody Men’s Chorus will offer “Singing Valentines” for a special someone on Thursday, Feb. 14, from 10 a.m. to 6 p.m. For $35, a barbershop quartet will sing two love songs and give a rose or box of candy along with a special Valentine’s Day card to the recipient. For more information or to schedule a singing Valentine, contact Jill and Ron Ventura at 937-606-2428. Miami-Shelby Barbershop Chorus members are, row one, left to right, Julian Fasano, Don Jones, Don Heffner, Ron Ventura, Gordon Davis, Don Bierley, Mark Swearingen and Gary Roeth; row two, Matt Blatchly, Jim Riley, Brad Boehringer, Gary Frick, Ken Crawford, Dale McKinney and Bob Moore; row three, Steve McCall, Chris Benge, Zack McCall, Dale Smith and Russ Schmidt; and row four, Mark Eickhoff, Dean Brewer, Scott Eickhoff, Jason Sink and Ben Finney. https://www.sidneydailynews.com/wp-content/uploads/sites/47/2019/02/web1_SingingValentines.jpgThe Miami-Shelby Melody Men’s Chorus will offer “Singing Valentines” for a special someone on Thursday, Feb. 14, from 10 a.m. to 6 p.m. For $35, a barbershop quartet will sing two love songs and give a rose or box of candy along with a special Valentine’s Day card to the recipient. For more information or to schedule a singing Valentine, contact Jill and Ron Ventura at 937-606-2428. Miami-Shelby Barbershop Chorus members are, row one, left to right, Julian Fasano, Don Jones, Don Heffner, Ron Ventura, Gordon Davis, Don Bierley, Mark Swearingen and Gary Roeth; row two, Matt Blatchly, Jim Riley, Brad Boehringer, Gary Frick, Ken Crawford, Dale McKinney and Bob Moore; row three, Steve McCall, Chris Benge, Zack McCall, Dale Smith and Russ Schmidt; and row four, Mark Eickhoff, Dean Brewer, Scott Eickhoff, Jason Sink and Ben Finney.